Safety Scorecard Signs - Is It a Sign of The Times or Time for a Sign? 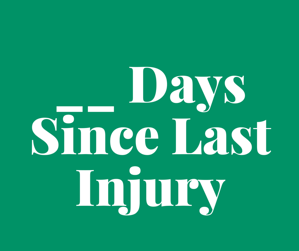 It seems standard at almost every industrial plant you enter or drive by that there’s a sign that says ___ days since last accident (last reported injury, last lost time accident, last time anybody needed a Band-Aid, etc.). Every time I pass one of these safety scorecard signs I wonder, who is the target audience? What is the desired result? And how often is that result achieved? I also wonder other things such as what is the affect on the target audience? Does 235 days since the last injury really make a worker want to celebrate? Does not having zero days make them feel depressed or propel them to point fingers at those who the company found fault in? Or do they wonder which injured employees were involved and if they are OK? I searched online for data on this topic but came up with nothing useful. The purpose of this blog is to poll you, the reader on your opinion on the purpose of these signs. Many people view these signs, what is your opinion? Who is the target audience for posting these numbers? What should we really be tracking/showcasing? At the risk of initiating a change in the way things are done and making a standard practice more effective, we want to extend a challenge. Submit your answers to the above questions in the comment section below and include your best recommendations of what the safety scoreboard should say that would better influence and inspire safer workplaces. Signed posters of who are you being safe for today? I look forward to your responses. Our judges are standing by…. will you win bragging rights?